Emissions produced by human activities have caused annual monsoon rainfall to decline over the past 50 years, new research has found. In the second half of the 20th century, the levels of rain recorded during the Northern Hemisphere’s summer monsoon fell by as much as 10 percent, according to researchers at the University of Edinburgh. The scientists determined that emissions of tiny particles from human activities, known as anthropogenic aerosols, were the cause. Levels of aerosol emissions have soared since the 1950s, with the most common sources being power stations and cars, the University of Edinburgh scientists found. 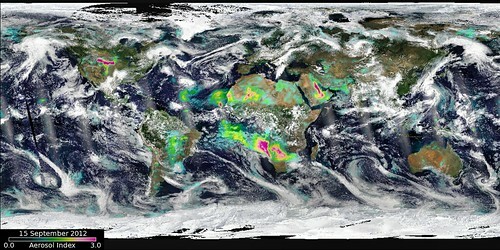 High levels of aerosols in the atmosphere cause heat from the Sun to be reflected back into space, lowering temperatures on the Earth’s surface and reducing rainfall. Alterations to summer monsoon rainfall affect human health and agriculture for billions of people, mostly those living in India, South East Asia and parts of Africa. Other researchers have concluded that aerosols emitted by human activities in non-Asian regions worsen the impact of Asian aerosols on the monsoon rains. A 2011 study by Australian scientists, “The impact of Asian and non-Asian anthropogenic aerosols on 20th century Asian summer monsoon,” highlight the importance of the non-Asian aerosols in exacerbating the impact of Asian aerosols on global monsoon rainfall, particularly across Asia. The Edinburgh research results appear to contradict the situation on the ground in South Asia in early September, where heavy monsoon rains and flash floods killed 128 people in Pakistan and 108 people in India. But University of Edinburgh scientists say their work provides clear evidence of human-induced rainfall change. The team calculated the average summer monsoon rainfall in the Northern Hemisphere between 1951 and 2005. They used computer-based climate models to quantify the impact of increasing aerosol emissions and greenhouse gases over the same period. They also took account of natural factors such as volcanic eruptions and climate variability to gauge the impact of human activity on the amount of monsoon rainfall. Researchers say levels of human-caused aerosols are expected to decline during the 21st century as countries begin adopting cleaner methods of power generation.